Many businesses still have questions regarding meal and entertainment expenses. Is the company holiday party fully deductible? How about meals and beverages at sporting events? The Internal Revenue Service issued transitional guidance under Notice 2018-76 to further clarify the newly amended IRC Sec. 274, relating to deductibility of business meals. The new rule eliminating deductions with respect to most entertainment, amusement or recreational activities appears to be well known. The remaining question was whether a meal provided at an entertainment event still qualifies for the 50% deduction. Holiday parties, summer picnics, and company socials are still fully deductible, however, the location of these events should be carefully considered, and they must be open to all employees. The cost of live music and other entertainment costs at these events are also included in the deduction. In the case of food and beverages provided during or at an entertainment activity, the food and beverages are purchased separately from the entertainment, or the cost of the food and beverages is stated separately from the cost of the entertainment on one or more bills, invoices, or receipts. The notice states that the entertainment disallowance rule may not be circumvented through inflating the amount charged for food and beverages. In Example 1, a taxpayer invites a business contact to a baseball game. The taxpayer purchases tickets for the game. While at the game, the taxpayer separately purchases hot dogs and drinks. While the game tickets are not deductible, the hot dogs and drinks are subject to a 50% deduction disallowance. In Example 2, the taxpayer invites a business contact to a basketball game. The taxpayer buys tickets for seats in a suite, where they have access to food and beverages. The cost of the tickets, as stated on the invoice, includes the food and beverages. Because the invoice does not separately provide the cost for food and beverages, the entire cost of the ticket is nondeductible. Example 3 has the same facts as Example 2, except that the invoice for the tickets separately states the cost of food and beverages. Because the food and beverage amount is separately provided on the invoice, this amount is subject to a 50% deduction, while the entertainment portion is disallowed. Maintain proper documentation and record-keeping. Receipts are required for meals over $75 (corporate cards given to employees also are acceptable). Businesses must document each meal's time and place, cost, attendees, business relationship, and the business purpose. Where a business may previously have had a single account, it should now have three to track entertainment, food, and holiday parties or company socials. 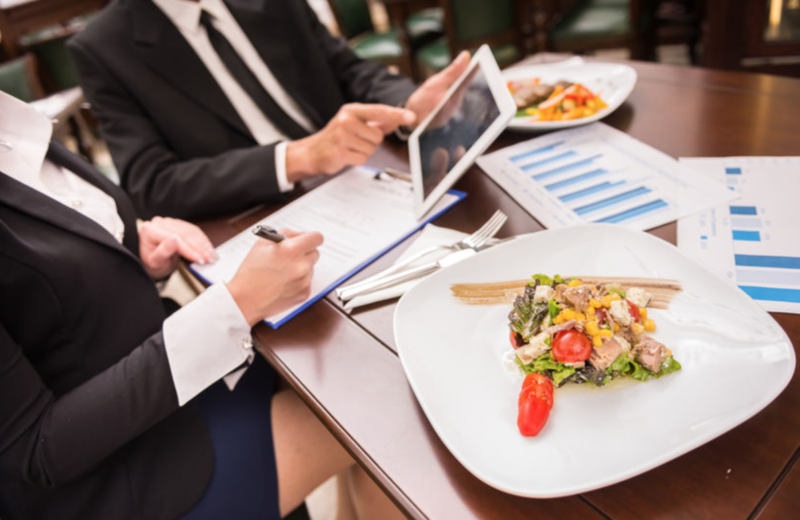 The IRS and Treasury Department intend to issue proposed regulations that will include guidance on the deductibility of expenses for certain business meals. Taxpayers may rely on the guidance of Notice 2018-76 for the treatment of business meal expenses until the proposed regulations are issued. For more information, contact Jeff Cohen, Partner, Tax Services Leader of Grassi & Co., at JCohen@grassicpas.com, or Alyssa Popov, Tax Manager at APopov@grassicpas.com.